On offer from us an impeccable range of Heat Measuring Instruments. Our range encompasses Crookes Radiometer, Steam Trap, Five Rod Form Conductometer, Liquid Convection Apparatus and more. These products are designed and developed in line with the latest technological advancements & facility in the market. The offered range is widely used to measure specific heat and converting the solar power into mechanical. Our quality experts check our range on well defined quality parameters using sophisticated testing equipment to ensure these are defect free. 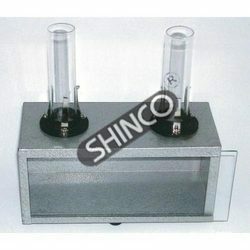 We have established a strong foothold in the industry by offering Calorimeter, Set Of Two. Owing to its feature like high strength, dimensional accuracy, easy installation and high functionality, the offered range is highly demanded in the market. 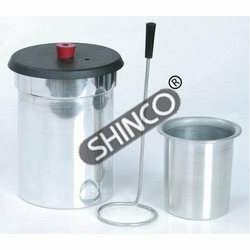 Furthermore, our patrons can avail all our products in numerous specifications as laid down by the clients. We are a leading name in this domain engaged in offering our prestigious patrons Compound Bar (Compound Strip). Owing to the differences in the co-efficient of linear expansion of both metals, the laminated strip bends dramatically on heating. 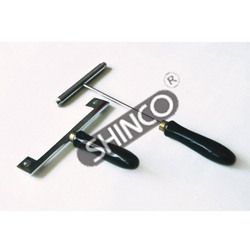 Available in different specifications, our quality products can also be customized according to the clients requirements. 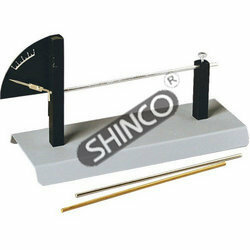 In order to cater to the vast market demands, we are engaged in offering Bar And Gauge Apparatus. These quality-approved products has a hole which just accepts the bar end, which is highly acclaimed by our valuable customers. 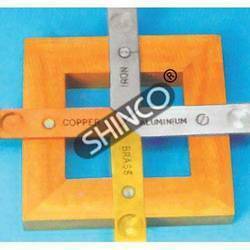 All our bar and gauge apparatus is designed and and developed in strict tandem with global quality standard and guidelines. 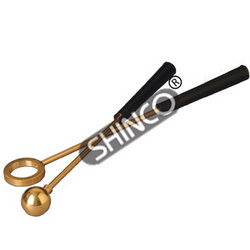 Owing to our profound knowledge of this domain, we are able to come up with Ring And Ball Apparatus. The products we are offering are manufactured using high quality raw material and ultra-modern tools & facility at our state-of-the-art infrastructure premises. With the help of our skilled & semi-skilled labors, our range is made in compliance with the international quality norms & standard. With sincerity and hard work of our professionals, we have carved a distinct niche for ourselves in this domain by offering Ingen Hauz Apparatus. The offered range is developed using premium quality raw material, procured from the legalized vendors of the industry with the help of our professionals. 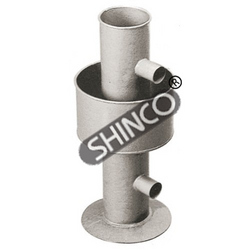 Leveraging on the support of our industry experience, we are able to come up with Gas Convection Apparatus. 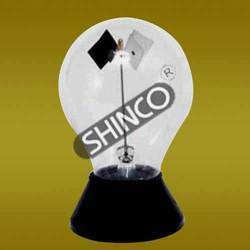 Manufactured and developed using high quality raw material that are procured from the most certified vendors of the market. Equipped with all the latest tools & technology in the, our quality products are made at our infrastructure premises. 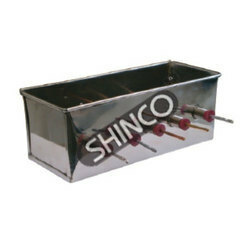 With an aim to stand tall on the expectations of patrons, we are engaged in offering Liquid Convection Apparatus. 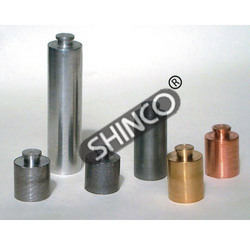 The offered range of products is widely appreciated in the market for various feature like high performance, long working life, better efficiency, great strength and long working life. 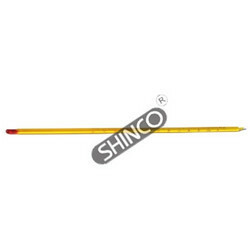 Customers can further avail all our products as per the specifications detailed by them. 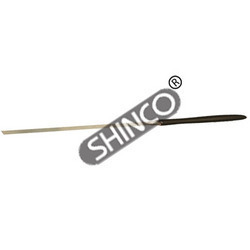 Backed by rich industry experience, we are engaged in offering a comprehensive range of Five Rod Form Conductometer. The offered range is used for demonstrating the different heat conductivity of five metals by observing the melting of wax. 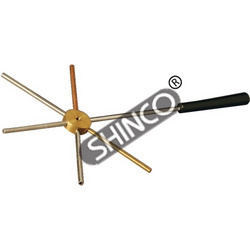 This range consists of five rod form conductometer 75 x 5 mm of aluminum, brass, iron, copper and stainless steel which are radially fitted on a brass disk of about 27 mm diameter. We have put forth for our clients an impeccable range of Steam Trap. 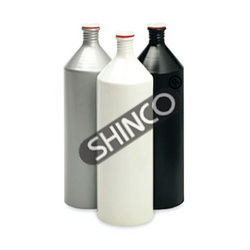 These products are used for preventing condensed water, which is being carried over with steam trap and is prepared in a laboratory steam generator. Extensively useful when determining the heat of vaporization with a steam calorimeter. 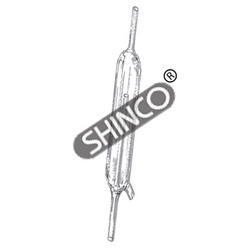 This range consists of a borosilicate glass chamber with a curved inner tube to prevent drops of condensed steam from escaping as well as a drainage tube. Supported by a team of skilled professionals, we are able to provide services for Crookes Radiometer to the clients. Our range is an excellent demonstration tool of the effects of heat and the conversion of solar power to mechanical power. These products consists of a set of vanes each shiny on one side to reflect the light and blackened on the other to collect the energy. 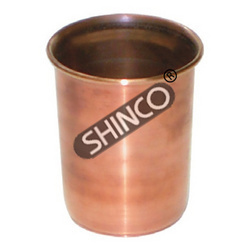 Inner copper vessel 75x50mm, with a recessed plastic lid, with hole for a thermometer and carrying a heating coil. Connection to the 3-4V DC power supply is via 4mm socket terminals. The outer aluminum vessel is 100x60mm. With stirrer. Supplied without the thermometer. For determining the mechanical equivalent of heat by measuring the heat generated in an electrical resistance. Includes the calorimeter set of two described above. 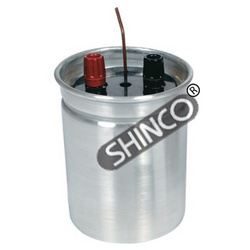 The plastic lid is with a heating coil to work with 6V supply or a battery, two 4mm socket binding posts for electrical connections, stirrer with an insulated handle and a single- hole rubber stopper for inserting a thermometer. Supplied without the thermometer. Requires a suitable voltmeter, ammeter, and thermometer (not supplied). For showing that when different metal cylinders are heated to the same temperature and immersed individually in an equal quantity of water, the rise in temperature of the water is directly proportional to the specific heat of the chosen metal cylinder. 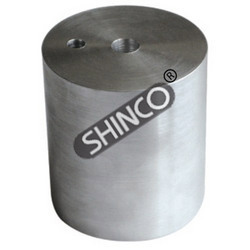 Individual cylinders can also be used for precise specific heat determination. Includes six cylinders made of aluminium, brass, copper, iron, lead, and zinc having diameters of 12.5mm. The length of each cylinder is adjusted so that all of them have the same mass. Determine specific heats of five different metals. Use with a calorimeter to determine various specific heats of metal cylinders. Includes specification sheet. 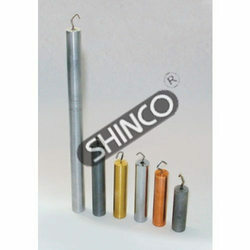 Set consists of aluminum, copper, zinc, tin,iron and lead cylinders. All the cylinders have the same mass (58g) and diameter (19mm). Accuracy is maintained by suspending the cylinder from a string rather than from a hook of a different metal;string is attached at the small, grooved knob. How to use: Exploring radiation and absorption. 1. Place black and silver containers near each other with thermometers inserted in each. 2. Angle a lamp so the light points directly at the sides of both containers. 3. Read off temperatures of each, with the light on, then off. Observe and record 10 minutes. The cans are fi nished with black, white, and silver exteriors, so students can easily determine the effect of surface color on heat transfer. Set of three 500mL cans with stoppers to accommodate thermometer. Supplied without thermometer. To show that water has a maximum density at 4ºC. 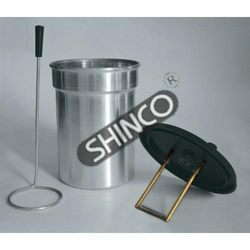 Consists of a sheet metal cylinder, with two tubes in the upper and lower regions for inserting thermometers through rubber stoppers. Mounted on a base and encircled midway by an outer trough for holding a mixture of ice and salt. Temperature of the water is measured at the top and bottom of the inner cylindrical vessel over a period as the water cools. Supplied without the thermometer. Excellent demonstration Crookes Radiometer tools of the effects of heat and the conversion of solar power to mechanical power. Consists of a set of vanes each shiny on one side to reflect the light and blackened on the other to collect the energy. 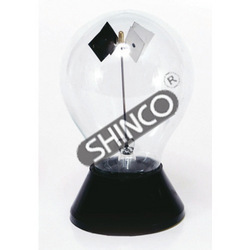 It is mounted in an evacuated glass bulb. When exposed to the sun or source of intense light it causes the vanes to spin. Comprising strips of copper, iron, aluminium and brass fixed on wooden frame meeting in the centre, outer ends of the strips formed with small cups to hold wax. For demonstrating the expansion of water on freezing. 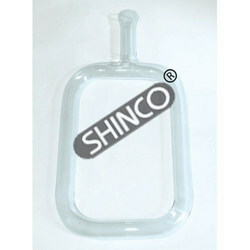 Consists of a cast iron bottle approximate 90x20mm with screw cap. To demonstrate the effect of thermal radiations on different type of radiations. 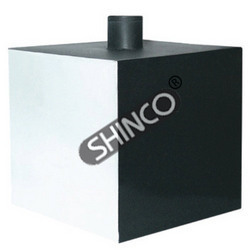 The sides of the cube are painted dull black, bright black, white and bright tin. Each side is 125mm.